I lost my favorite Greek oil dispenser that I’ve had for years in a recent move and am still upset about it. I actually got it in Greece on an exceptionally wonderful summer trip and it held much sentimental value. Because I’m just not ready to emotionally invest in another right now, no matter how shiny and new, I decided instead to use a pour spout on my favorite bottle. 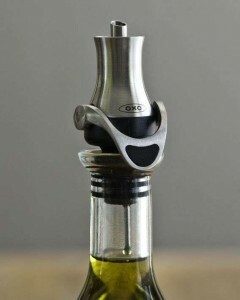 This spout by Oxo has a flexible, ribbed stopper that fits all different size bottle necks. 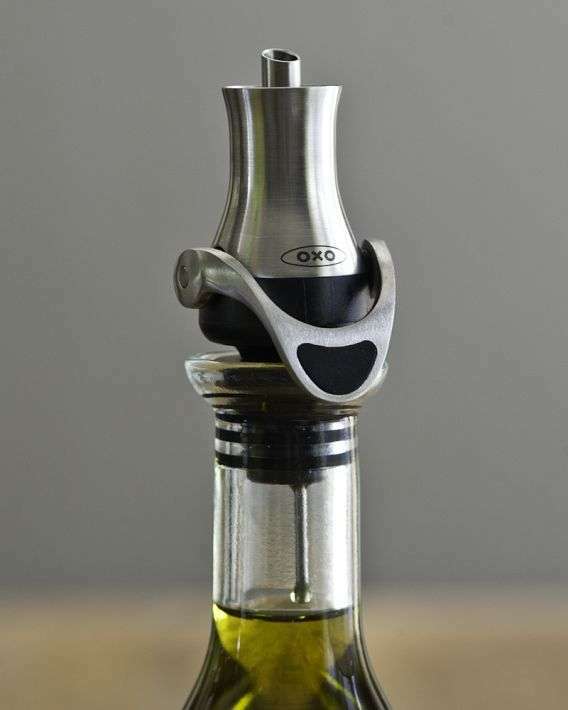 The easy close lever prevents additional oxygen from getting into the bottle which of course helps keep your oil fresher, longer. There are certainly prettier ones around, but for about $10 at Williams-Sonoma, this stainless and black number is a find. Thought I’d pass it on!